Home >> Airlines >> SpiceJet >> Spicejet pre-tax loss narrows to Rs 124 crore in Q1 FY2015. Company says due to restructuring. SpiceJet Boeing 737-800WL VT-SZK in special crew livery. With all our heart slogan. Photo courtesy Spicejet. Spicejet pre-tax loss narrows to Rs 124 crore in Q1 FY2015. Company says due to restructuring. 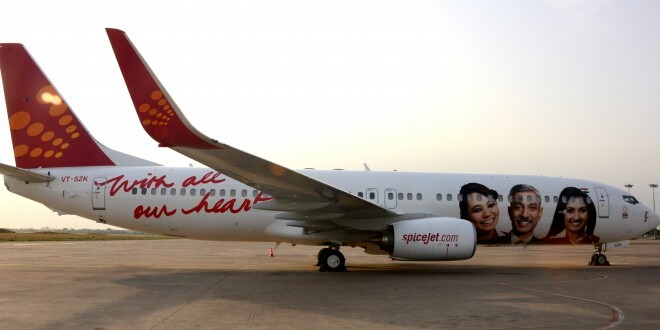 Embattled low fare carrier SpiceJet, reported a loss before tax of Rs 124.10 crore (approx. $20.8 million) for the first quarter of fiscal 2014~2015, ended June. This compared to the profit of Rs 50.56 crore in the same quarter a year earlier. Total income from operations fell to Rs 1,691.04 crore down from Rs 1,701.54 crore in the same quarter last fiscal. Expenses driven by a depreciating Rupee, higher fuel costs, and one-time expenses related to returning five leased aircraft climbed to Rs 1,782.95 crore up from Rs 1,641.93 crore in the first quarter last year. The airline’s accumulated losses and liabilities now stand at Rs 2,647.85 crore which is Rs. 1,145.57 crore greater than shareholder funds of Rs 1,502.28 crore. The airline has returned a net of five aircraft to lessors in a bid to rationalise costs. Two aircraft were returned as scheduled, four early, and one aircraft was added to the fleet. The airline is relying heavily on its on-going measures like route rationalisation, cost-cutting, focus on on-time performance, and restructuring, and in fairness to the company, it is just beginning to showing results. Revenue per available seat kilometre (RASK) is steadily improving. The company though has not released its cost performance figures. Spicejet Revenue per available seat kilometre. Q1 FY2015. Extracted from airline statement. SpiceJet achieved an operating profit of Rs 9 cr for the quarter (not considering restructuring and certain one-off costs described below) despite an adverse year-over-year impact on expenses of fuel price and foreign exchange rate of Rs 106 cr. 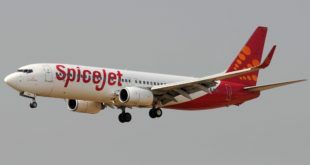 As a result of the above restructuring and certain one-off costs totalling Rs 133 cr, SpiceJet reported a net loss of Rs 124 cr for the quarter ending June 2014. There has been a lot of speculation and numerous comments and questions relating to SpiceJet’s frequent market stimulation efforts, as well as on whether the increase in loads and market share is at the cost of revenue dilution or top line revenue reduction. The revenue results above clearly indicate that our market stimulation efforts are driving not just higher loads, but higher unit revenue (RASK) as well, which is the purest measure of revenue performance as it is the mathematical product of Load Factor and Yield. As a result, SpiceJet’s top line revenue remained constant despite capacity reduction of 8.4%. We believe that SpiceJet’s market stimulation efforts have had a positive impact on the travel industry as a whole by helping increase demand to fill seats that would otherwise go empty, benefitting not just the airline through incremental revenue, but also customers who are getting much more affordable fares if they are willing to book early, and for all other players in the travel value chain due to the increased volume of travel. SpiceJet is the airline that has made flying truly affordable on a pan-India basis for those who are willing to book early. In turnaround situations that are accompanied by capacity reduction, the revenue impact of reduced capacity is felt instantly, while fixed costs associated with the previous capacity tend to be more “sticky” and take longer to take out of the system due to contractual obligations, notice periods, and other such constraints. The restructuring and certain one-off costs of Rs 133 cr therefore needs to be viewed in this perspective. Notwithstanding that, SpiceJet’s transformation is well under way, with rationalized capacity, an all new network, strong revenue performance trends, a slew of new products such as SpiceFlex and SpiceMAX to improve yields, and with a massive productivity improvement, increased asset utilisation, and cost reduction program that is currently ongoing to drive all controllable costs down to lowest possible levels. Benefits of the intensive restructuring will become increasingly visible in the coming months. It is gratifying to note that these efforts are already paying off: In July 2014 SpiceJet achieved a Load Factor of 79.5%, which is by a large margin the highest in its history for the month of July. Read the SpiceJet first quarter fiscal 2015 results release including performance charts here.